Jack Leaning produced some meaty blows in his 64 that helped Yorkshire to victory over Northants and into the T20 quarter-finals. YORKSHIRE completed a remarkable comeback to book their place in the quarter-finals of the NatWest T20 Blast. Bottom of the North Group at the halfway stage, Yorkshire’s sixth win in seven games saw them finish in third place. It was not quite enough to secure a home quarter-final; Yorkshire had to win by a margin of at least 19 runs to achieve that, and they prevailed by 14 against a team who thus pipped them to a home tie. But simply to qualify was a great achievement by Alex Lees’s men, who will play Glamorgan at Cardiff on Thursday, August 11. Yorkshire, who as it turned out would have qualified even if they had lost due to Birmingham’s defeat to Lancashire at Old Trafford, hit 177-5 from their 20 overs, Jack Leaning scoring a T20 career-best 64 from 29 balls and Lees 59 from 50 deliveries. 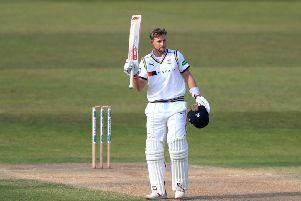 Leaning and Lees added 100 for the fourth-wicket, and Yorkshire scored the same amount from the last eight overs to set a challenging target. Ben Duckett hit 41 of the first 46 runs in Northants’ reply before falling to the last ball of the six-over powerplay, and captain Alex Wakely hit 64 from 42 to take his side close. But Tim Bresnan closed the game out on his way to 3-15, and no one will fancy facing Yorkshire at present. “After the first four games of the competition, I don’t think anyone gave us a chance of qualifying,” said Lees. “Since then, things have just clicked, and anything can happen in the quarter-finals. “It would have been nice to have got a home tie, but we’re just happy with the win and to get through. After Lees continued his remarkable success rate at the toss, winning his 15th in 18 limited-overs matches this season, the visitors lost their first wicket to the eighth ball. Adam Lyth had square-driven the opening delivery of Richard Gleeson’s over to the boundary in front of the old signal box, but when he tried to repeat the feat to the next ball, he was smartly caught by Graeme White at backward-point. Gleeson and Rory Kleinveldt performed well with the new ball, restricting Yorkshire to 19 from the first four overs, and David Willey fell to the final delivery of the fifth when he slashed Steven Crook to backward-point, where White again showed a safe pair of hands. Yorkshire hit 34 in the six-over power-play, with only four boundaries, as though they were a little unsure whether to stick or twist. Lees broke the shackles with a cover-driven four off Crook, and then he swept successive boundaries off Josh Cobb to lead his side to 63-2 at halfway. Travis Head fell without addition to the total when he was bowled by White. Yorkshire were then indebted to some meaty blows from Leaning. He struck White for successive leg-side sixes to inject much-needed impetus. Northants lost their way as Leaning took full advantage of three full-tosses from the returning Kleinveldt, each of them clinically deposited over the leg-side boundary, with runs belatedly arriving with a vengeance. Lees whipped Azharullah to the mid-wicket boundary to reach fifty from 45 balls, and then he straight drove the next delivery for four. Lees was pinned by Azharullah’s next ball, a high full toss, and threw down his bat in annoyance and frustration. In the same over, the 18th of the innings, Leaning went to fifty from 22 balls and celebrated with his first four – over mid-off – to go with his quintet of maximums. Lees departed in the 19th over, bowled by Gleeson as he aimed to leg, and Leaning fell in the last over to a good low catch at deep mid-wicket by Rob Keogh off Azharullah. Northants could not have made a worse start to their innings as Willey trapped Cobb lbw with the first delivery. They fell to 20-2 in the fourth when Adam Rossington skied Bresnan to mid-on, and Rafiq took the key wicket of Duckett when the left-hander top-edged a reverse-sweep to Willey at short third-man. Rashid bowled Crook with a sharply-spun leg-break, and Willey bowled Keogh in the 17th over to end a stand of 66 with Wakely. Wakely and Kleinveldt were both caught on the straight boundary in the final over from the excellent Bresnan.